Cooking Classes in Florence | Travel to Florence.com, your online travel guide. A great way to learn about any culture is through its food and Italy is no exception. The region of Tuscany is known for it's mastery of the culinary skills and wine making. Cooking classes in Florence have become a popular activity to do during a vacation and it allows you to break up all the museums and sightseeing with a real Italian experience. Taking one of the many cooking classes in or around Florence is like giving yourself a gift that you can use and enjoy for the rest of your life. Each of the cooking classes in Florence offer different things, some start with a trip to the market and others have instructors that are master chefs. It is up to you to tailor the cooking class to what you would like to get out of it. Some people like to be challenged by a professional chef while others just want to have fun and see how it would feel to be a local Florentine shopping and preparing the freshest ingredients into an amazing rustic feast. 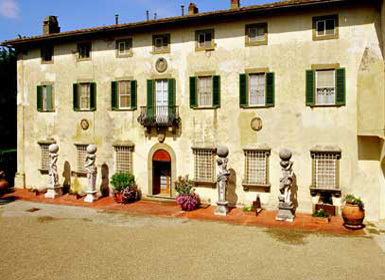 If you are looking for the "Foodie" experience of a lifetime, there are weeklong cooking schools like Tenuta di Capezzana Wine and Culinary Center, which is located on a large estate just outside of Florence and classes are held in a Medici villa kitchen. If you don't have five days free, Tenuta di Capenzzana also offers a one day class where upon completion participants receive a bottle of wine or a bottle of their wonderful olive oil and a personalized apron. If you are looking for a more relaxed and fun experience then the cooking classes of Faith Willinger may be just what the doctor ordered. Faiths cooking classes have been featured on television shows such as, "Chefs of Cucina Amore" and "Passport to Europe" with Samantha Brown and also the New York Times. Faiths cooking classes are called "Lessons in Lunch" which take place on Wednesdays at noon and include snacks, lunch, wines and plenty of instruction to make you the envy of all your friends! Faiths cooking classes are definitely the most fun and she will have you enjoying yourself so much you may forget this is supposed to be educational. The prices for the different cooking classes in Florence vary greatly and are constantly changing mostly due to the fluctuating euro. Below are links to a few of our favorite cooking classes. You can send them an email to inquire about reservations, price and even menus. We have found "in Tavola" to be a great value for its combination of price, instruction, staff and great location ( conveniently located near the Ponte Vecchio). Their classes usually run about four hours long and you prepare a four course meal with dishes like three different kinds of risotto or three different kinds of pasta and dessert. The classes are broken up into two groups, one is taught in Italian the other group taught in English so don't worry about the language barrier. Taking a cooking class in Florence will not only be the highlight of your trip, it will also be something that you will remember forever. Every time you make that amazing pasta dish or rich risotto you will instantly relive your vacation in Florence. How's that for value? !